Another great week here @ Saugerties Furniture Mart! New styles from Rowe Furniture, Smith Brothers, & Daniels Amish are hitting the floor for the summer season -more on that in another post. I wanted to share with you another review from one our valued customers. This is why people shop at Saugerties Furniture Mart. Thank you! The entire experience from when we first came to your showroom to delivery was fantastic! You guys get an A++ for customer service and quality of furniture. We will be back! Click here to learn more about about our store and the products we carry. 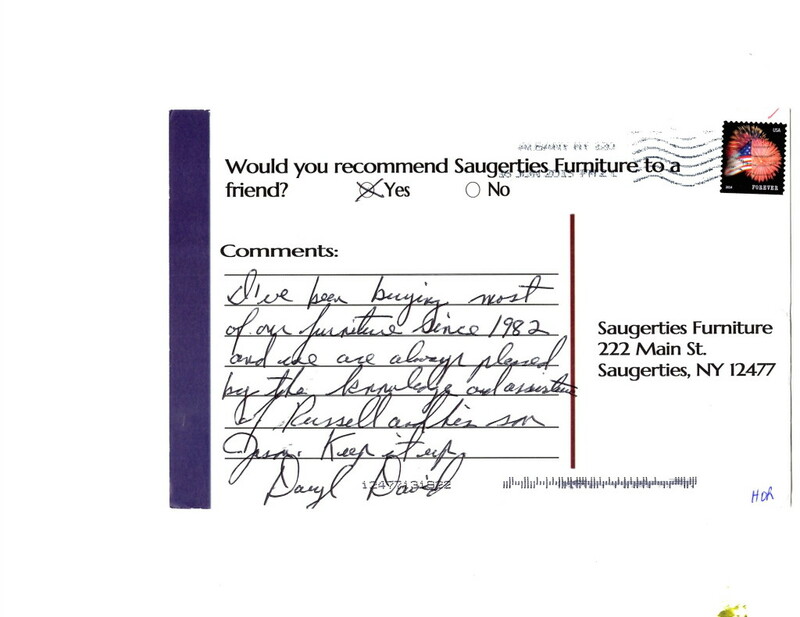 Saugerties Furniture Mart Review – Pleased by the knowledge & assistance. I wish I had time to share all our great customer feedback we get. Since 1947 our family has continued to help people find the furnishings that are right for their home and are made to last! You can see all our testimonials/reviews here on our website. 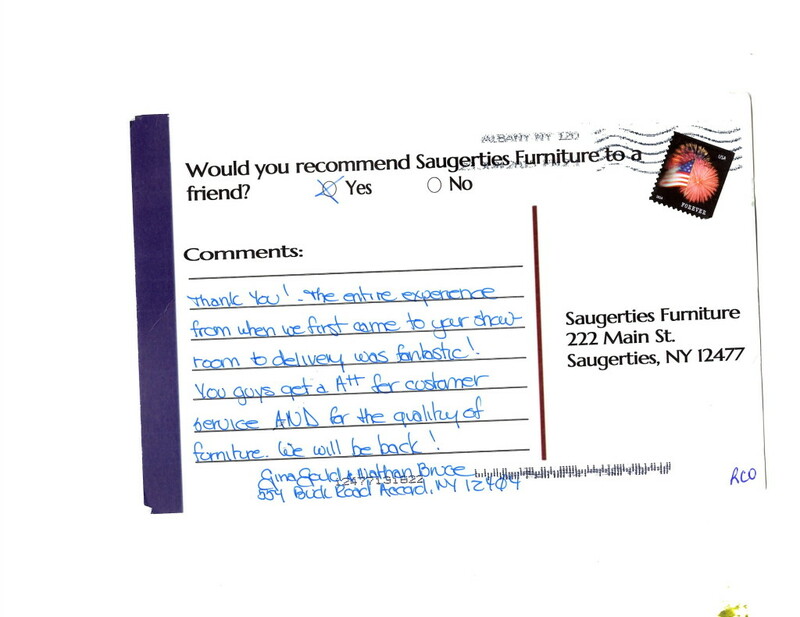 Another stellar review from a satisfied Saugerties Furniture Mart customer! Our furniture is so well built is sells itself, we’re just here to help you pull it all together without any pressure or gimmicks. 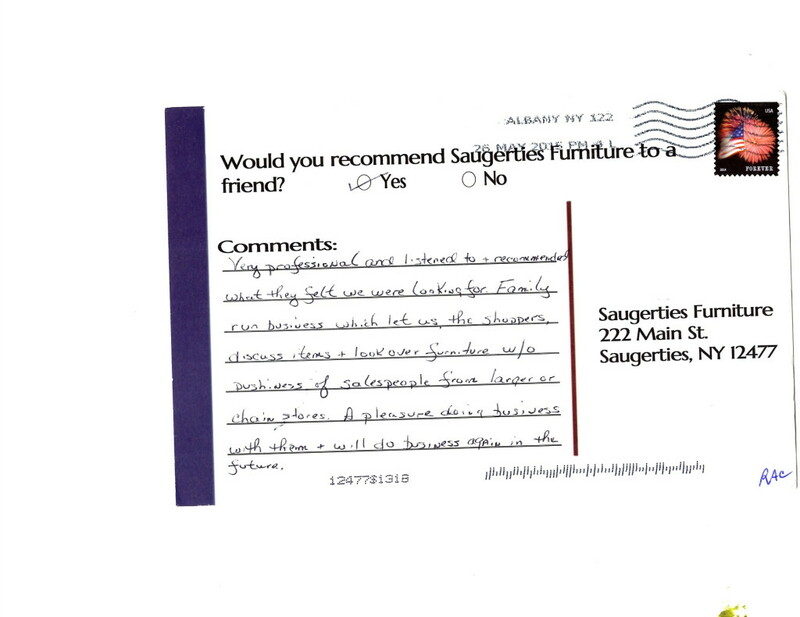 Click here to read more reviews from satisfied Saugerties Furniture Mart customers. Saugerties Furniture Mart Review – Furniture is Excellent! 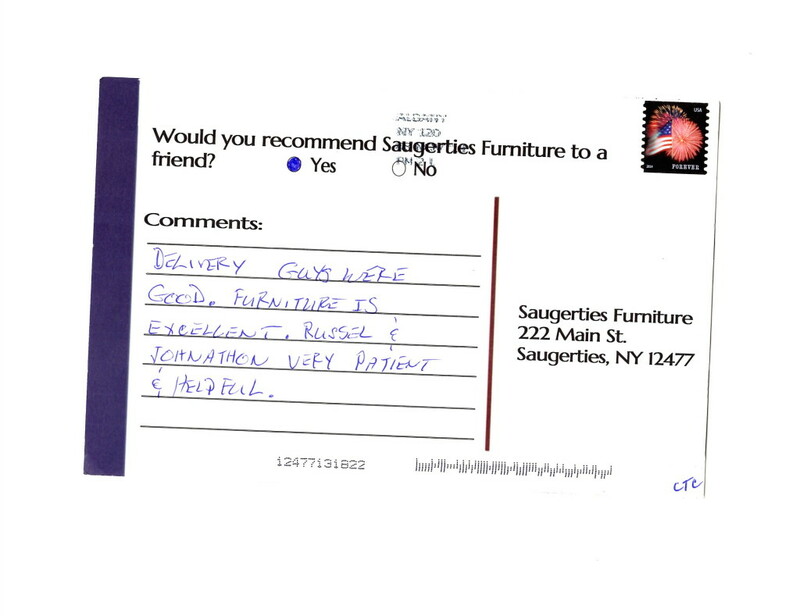 Kind words from a satisfied customer of Saugerties Furniture Mart. We love to help our customers, not just sell, that’s why we don’t have commissioned sales people just family members who can help you find the furniture that’s right for you. We also have EXCELLENT delivery people, not just good as in the review, but since it was the first thing mentioned we know they were excellent! Delivery guys were good. Furniture is excellent. Russell & Jonathan very patient and helpful. Browse our online website by clicking here!